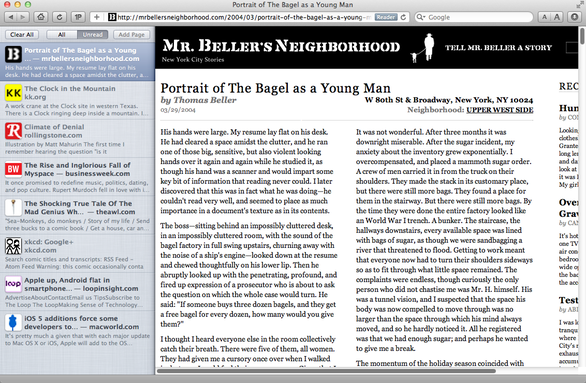 Thanks to its new Reading List feature, Safari has gotten a lot of attention in Apple’s PR push for Mac OS X Lion. But the built-in Web browser for OS X, Safari 5.1, gets many other Lion-focused changes and improvements that are worth your attention. Note that you can also download Safari 5.1 for Snow Leopard and Windows. Users with those operating systems will be able to take advantage of some features, such as Reading List and revamped privacy preferences, but other enhancements are strictly Lion-only. In this first look, we’ll focus on what’s new and different in the latest version of Safari, largely from the viewpoint of Mac OS X Lion. Safari 5.1’s flagship feature is Reading List, which lets you “save” interesting articles for later reading. When you come across an article on the Web that you just don’t have time to read immediately, or that you want to keep around for later reference, you simply choose Bookmarks: Add To Reading List (or press Shift-Command-D), and that article is added to your list. You can view your Reading List at any time—it appears as a sidebar on the left-hand side of the Safari window—by choosing View -> Show Reading list, by clicking the Reading List icon (which looks like a pair of eyeglasses) in Safari’s Bookmarks Bar, or by pressing Shift-Command-L. Your saved articles are listed here, each displaying the article title, the host site’s favicon (Web icon), and a two-line preview of the article’s content. Click any article in the list to view it in the main part of the Safari window. Once Apple’s new iCloud service is up and running in the fall, and you’ve set up your iCloud account on all your Macs and iOS devices, your Reading List will be synchronized between all those devices in a manner similar to the way Safari bookmarks are currently synced via MobileMe. Add an article to your Reading List on your iPhone in this iCloud-driven future, and it will be waiting in Safari on your Mac once you get back to your desk. Reading List is similar in principle to services such as Instapaper and Read It Later. But Reading List lacks many of the features that make these services so popular. For example, Reading List doesn’t store articles for offline viewing—when accessing a saved article in the Reading List, your computer must be connected to the Internet. Similarly, while Safari’s Reader feature lets you view an article in a format optimized for reading—bereft of ads and messy formatting, similar to the Readability Web service or Instapaper’s own Mobilizer—you can’t save this more-readable version to your Reading List. In other words, Reading List is in many ways just a prettified list of bookmarks. Safari's Reading List feature lets you save articles for later reading. In contrast, Instapaper also lets you organize saved articles into folders; share your lists of articles with friends; add articles to your list via email; and download articles in formats optimized for different devices. The Instapaper iOS app even tracks your current reading position when you switch between devices, and scores of Mac and iOS apps let you add articles to your Instapaper list without making you first open those articles in Safari. And, of course, Instapaper works in any browser, not just Safari. In other words, as with support for RSS feeds (added in Safari 3), Apple has chosen to include a bare-bones, easy-to-use “read later” feature that will satisfy a good number of users but will leave more-advanced users wanting. Indeed, it’s likely that services such as Instapaper and Read It Later will actually gain users thanks to Reading List, as more people see the utility of a read-this-later feature but, frustrated with Reading List's limitations, look for better options. As with much of Lion, Safari 5.1 adopts a number of touch-based gestures for those with compatible input devices, such as Apple’s Magic Trackpad, Magic Mouse, and recent MacBook trackpads. For example, if you double-tap on a block of text—alas, with two fingers, rather than one, as on iOS—Safari will zoom in on that column or paragraph; double-tap again to zoom back out. And pinching in and out with your thumb and index finger zooms out and in, respectively, on the Web page; cleverly, unlike when clicking Safari’s Smaller/Larger buttons (or pressing Command-Minus and Command-Plus), Safari focuses the zoom on whatever is directly beneath the cursor. You can also two-finger swipe to the left to go back one page in the current tab’s history, or to the right to go to the next page in that history. Oddly, the entire page “slides” off the screen, which makes it appear as though you’re switching between tabs. Unfortunately, there doesn’t seem to be a gesture for that action. Safari 5.1 also adopts another of Lion’s flagship features: full-screen mode. Click the full-screen button in the upper-right corner of the Safari window (or press Control-Command-F), and the menu bar and Dock disappear, the current Safari window stretches to fill the entire screen, and the window’s title bar and bookmarks bar fade away, giving you as much viewable browser-window area as possible. (This full-screen view is actually a new workspace, so you can switch between it and other apps using Lion’s three-finger sideways-swipe gesture.) Move the mouse cursor to the top of the screen and the menu bar and bookmarks bar slide into view. Though they won’t garner big headlines, a number of changes in Safari 5.1 offer significant improvements when it comes to security and keeping your personal information private. (These new features are accessible to Snow Leopard users, as well.) For starters, a new Private AutoFill feature doesn’t automatically enter your personal info into Web forms until you give the OK. You can even choose the specific info to be filled. Safari 5.1 offers improved control of privacy-related settings. But the most telling change is that Safari’s preferences window gains a new Privacy screen that consolidates most privacy-related settings (removing them from the Security screen). This is where you now choose when Safari accepts cookies—interestingly, now phrased as when Safari should block cookies—and where you view, by site, the cookies already stored by Safari. But whereas earlier versions of Safari showed only cookies, Safari 5.1 displays, for each site, exactly what data Safari has stored for that site: cookies, caches, databases, and other local storage. (Unfortunately, that’s all the detail you get—missing is the detailed view of Safari 5.0, which showed you the name, path, security status, expiration date, and contents of each cookie.) You can also now delete all stored data—for either a particular site or for all sites—with a click. This action even deletes Flash plug-in data. Note that the setting for whether or not sites can store databases on your Mac to begin with, and the size limit for those databases, has been moved to the Advanced screen of Safari preferences. Safari 5 debuted a setting (in Security settings) to allow or deny access to your physical location when a Website requested it. In Safari 5.1, you get a bit more control over that location information: your options (now in the Privacy screen) are to deny access completely, to be prompted once for each site (which gives perpetual access to those sites you approve), or to be prompted once each day for each site. 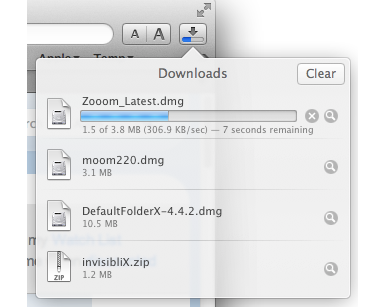 The new Downloads popover is more streamlined but makes it more difficult to monitor download progress. One of the features that’s gotten the biggest aesthetic makeover is Safari’s Downloads list. In older versions of Safari, you viewed this list as a separate window; in Safari 5.1, it’s hidden behind the Downloads button, located (by default) at the right-hand edge of Safari’s toolbar. Click this button and you see a iOS-like pop-over listing all downloads, with the newest at the top. While the button's tiny progress bar is occasionally useful for monitoring the progress of a download without having a separate window open, you can't monitor simultaneous downloads without activating the pop-over, and you can’t choose to keep the pop-over visible—once you click anywhere else in Safari, the pop-over disappears. It would be great if Apple offered the option to choose between a pop-over and a separate Safari 5.0-style Downloads window. On the other hand, the new Downloads list does provide one oft-requested feature: You can now move a downloaded file by simply dragging it from the list to the desired location in the Finder—you no longer have to reveal it in your Downloads folder first. Safari 5.1 also includes a slew of minor improvements—“minor” in that they’re not advertised or not completely obvious. For example, when you Command-click a link to open it in a new tab, the new tab opens directly to the right of the current tab, rather than at the right-hand end of the tab bar. This is a popular feature of the LinkThing Safari extension, so users of that extension will appreciate that the behavior is now standard. When you first log in to certain types of webmail accounts, Safari in Lion offers to set up that account in OS X. A change that will be useful for new-to-Mac people is that Safari 5.1 offers tighter account integration with other OS X apps. When you first log in to a Gmail, Yahoo Mail, or AOL email account from within Safari, OS X will offer to automatically set up that account (and, thus, information syncing) in Mail, iCal, Address Book, and iChat. There’s also a new button, in the Advanced screen of Safari preferences, to change your proxy settings (although it simply opens Network preferences). And Apple now allows extensions that provide their own toolbar to present iOS-like pop-overs with HTML content. Other under-the-hood changes include improved multiprocessor support and better overall performance; better hardware-graphics performance; HTML5 media caching for offline viewing and better low-bandwidth behavior; support for MathML, the Web Open Font Format (WOFF), and additional CSS features; and the capability to search for text that either starts with or contains your search string. There’s one more Safari trick hidden away in Lion. When you install Lion onto an internal hard drive, the installer typically partitions your startup drive to create a hidden, bootable recovery partition that lets you repair your Mac’s startup drive, reinstall Lion, and even restore your drive from a Time Machine backup, without requiring a separate drive or disc. Conveniently, that restore partition provides network connectivity and includes a version of Safari, so you can browse Apple’s support website and other sites while booted from the emergency partition. You can even log in to Web-based email systems to read and send messages. Although being able to access the Web from your Mac while troubleshooting that same Mac isn’t as big of a deal these days as it used to be, thanks to the proliferation of Web-browsing phones and tablets, this is still a welcome and convenient feature. Safari 3—which added tabs, RSS reading, pop-up blocking, auto-fill, and more—remains the biggest single Safari update in terms of usability and visible feature improvements. But Safari 5.1 continues a concerted effort, started in Safari 5.0 with Reader and extensions, to improve the overall Web-browsing experience. While some of the new features, such as Reading List, don’t live up to the hype, there are enough improvements, both obvious and under-the-hood, to make Safari 5.1 a nice upgrade from version 5.0. We’ll have the last word on Safari 5.1, including how it compares to other Mac browsers, in our upcoming full review.